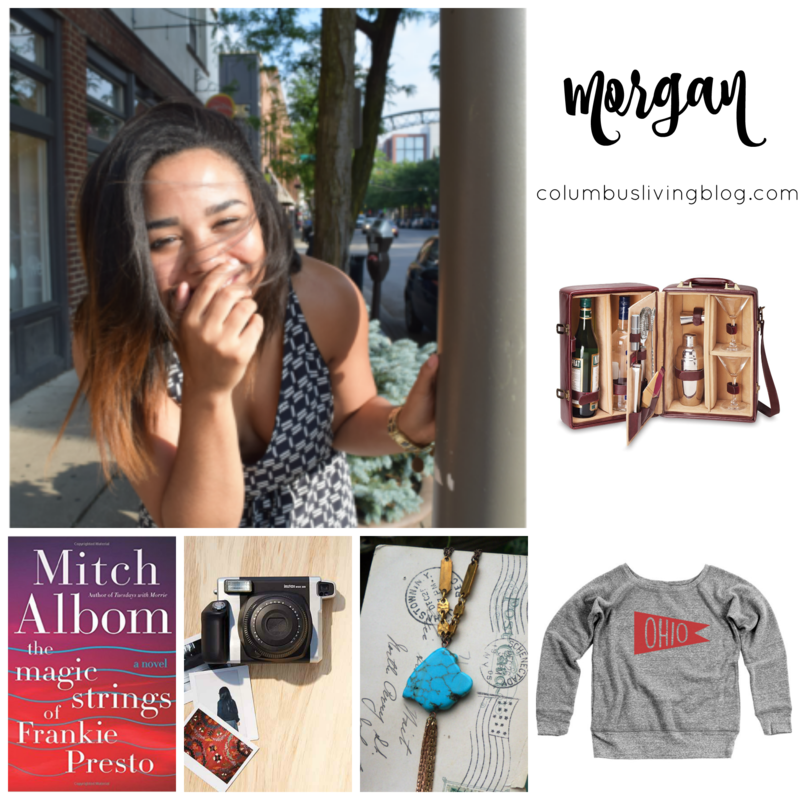 Annnd today, we have Part 2 of the Columbus Bloggers’ Wish Lists round-up! 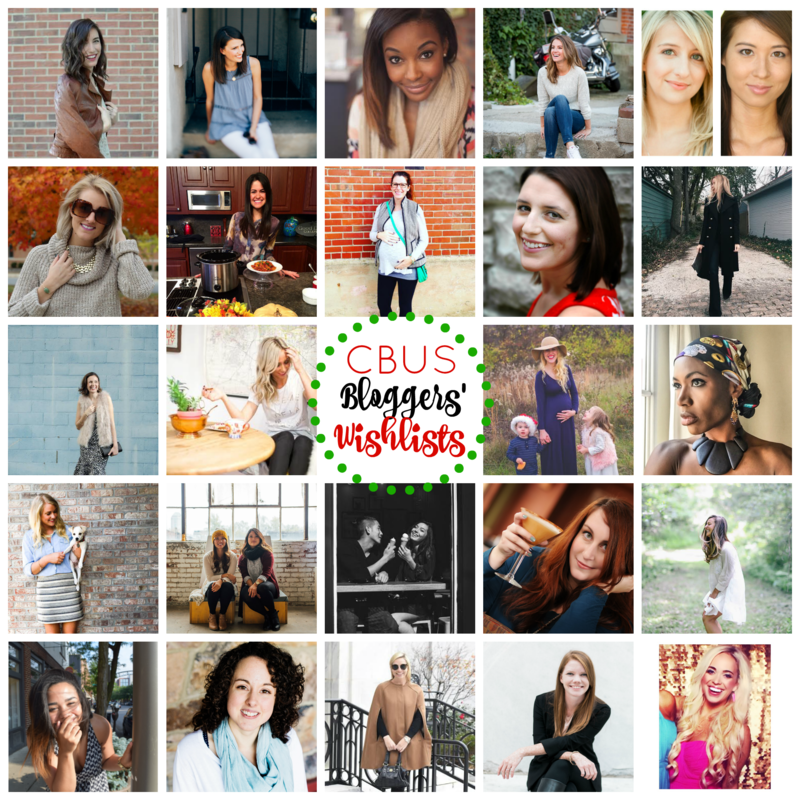 I can’t think of a better way to start wrapping up the year than with sharing the holiday wish lists of some of my favorite ladies in Columbus! Some of their unique gift ideas may even help you finish your shopping 🙂 You can check out Part 1 of the Wish Lists HERE. Madewell Transport Tote – I want this to be my diaper bag! I bought an insert that makes it easy to transform any bag into a diaper bag–I’ve had my eye on this one for awhile! Baby’s First Year Memory Book – I love that this seems easy to keep up with, plus it’s so so darling! bareMinerals Original Foundation – My absolute favorite everyday foundation. Love to stock up on my essentials at Christmastime! Kate Spade Canister – All of the Kate Spade home goods are so dreamy. 2016 Rifle Paper Co. 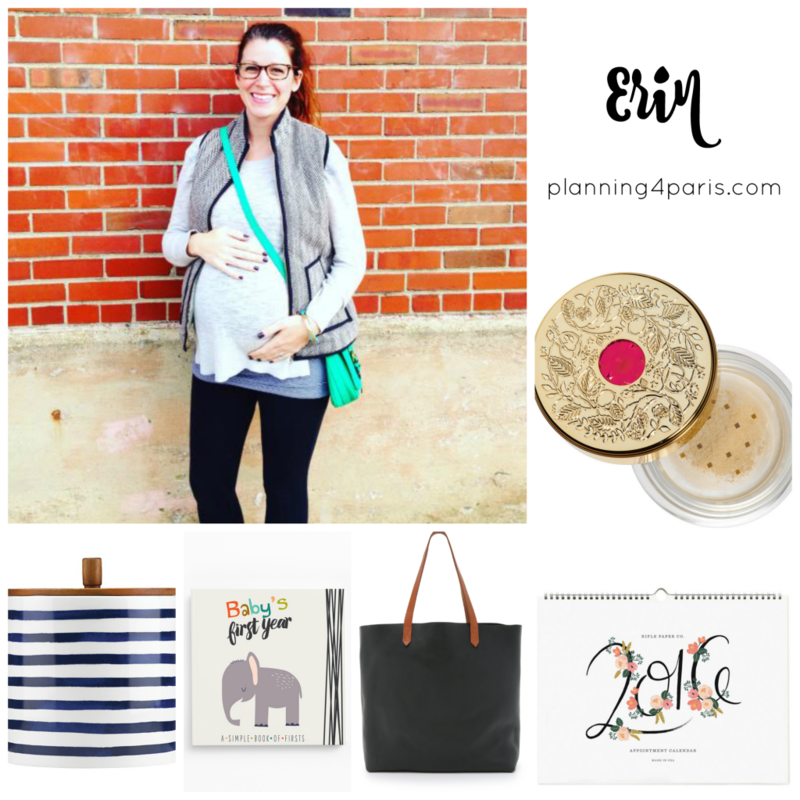 Appointment Calendar – We have lots of appointments coming up in 2016 with baby’s arrival in just a few weeks! Timberland Boots – the perfect warm weather boot that doesn’t look like a weird rainboot for men, but a practical stylish shoe. Express Wool Peacoat – camel colored coats reserved for investigators no more! OYO Whiskey Set – Limited edition batch 002 Oloroso Wheat Whiskey was released just last week. and we want it. Abercrombie & Fitch Red & Black Flannel – Not only is it the perfect color to wear all xmas weekend, (yeah I’m with family, so I’ll probably wear the same thing every day), but also for all OSU related events. All plaid, erryday. One Six Five Stacking Rings – Perfect simple rings by themselves or stacked lovingly on top of each other, Kaleigh & Claire kill it every time with their jewelry collections. Sierra Maxi Dress – I drool over For Love & Lemons on the regular, and this dress was love at first sight, at $333 dollars it might be a joint venture xmas gift and I have no where to wear it yet, but whatever, I’ll wear it around the house until it’s warm again outside. CREED Royal Mayfair – The notes of Scottish Highland Pine, Windsor Roses, and Canadian Cedar immediately got my attention the moment I smelled it! I would love this to become part of my fragrance collection even if it’s a men’s cologne! J. 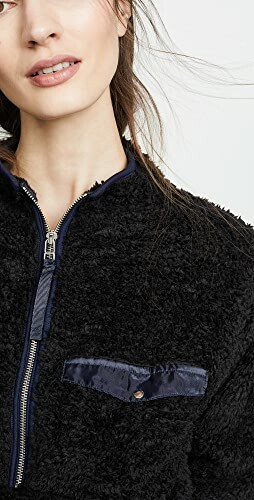 Crew Collection Double Breasted Blazer – I have been on the hunt for the perfect blazer to wear to work. This brunswick blue beauty from J. Crew would be PERFECT with any piece from my closet! Loren Hope Siren Studs – These deep sea studs add just enough glam to any outfit ! 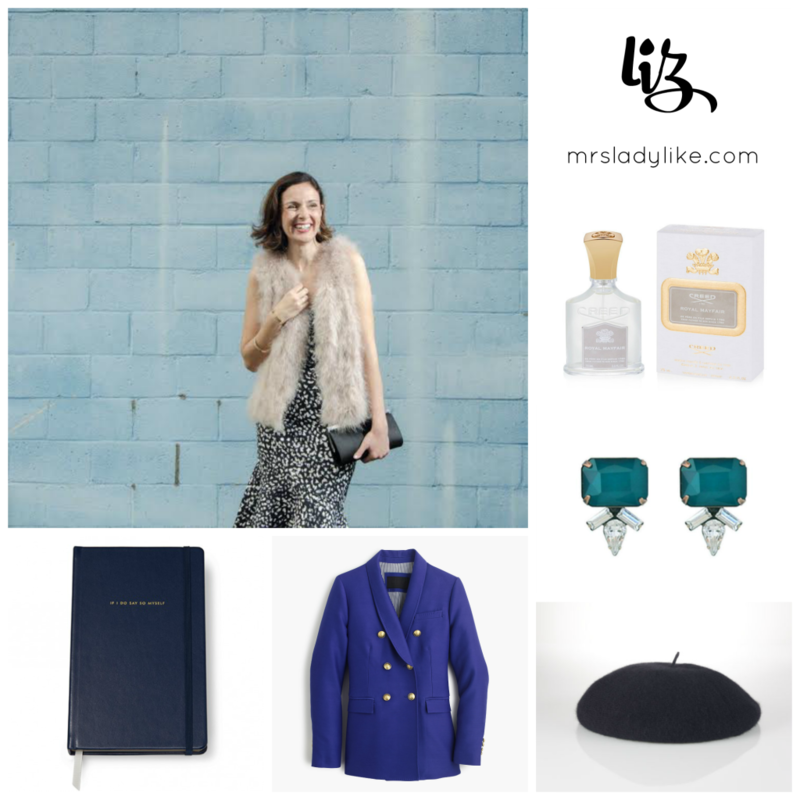 Ralph Lauren Cashmere Beret – Mrs. Ladylike does like classic pieces, so it’s only natural that this cashmere beret makes its way into her winter accessory arsenal! Festive Tie-Up Heels: As much as my feet hate me for it, I’m 100% a heel girl. I’ve had my heart set on a tie-up pair for awhile, and these metallic shoes make me want to use the heart eye emoji ten times. They’d be perfect for a holiday party paired with a LBD or red party dress. 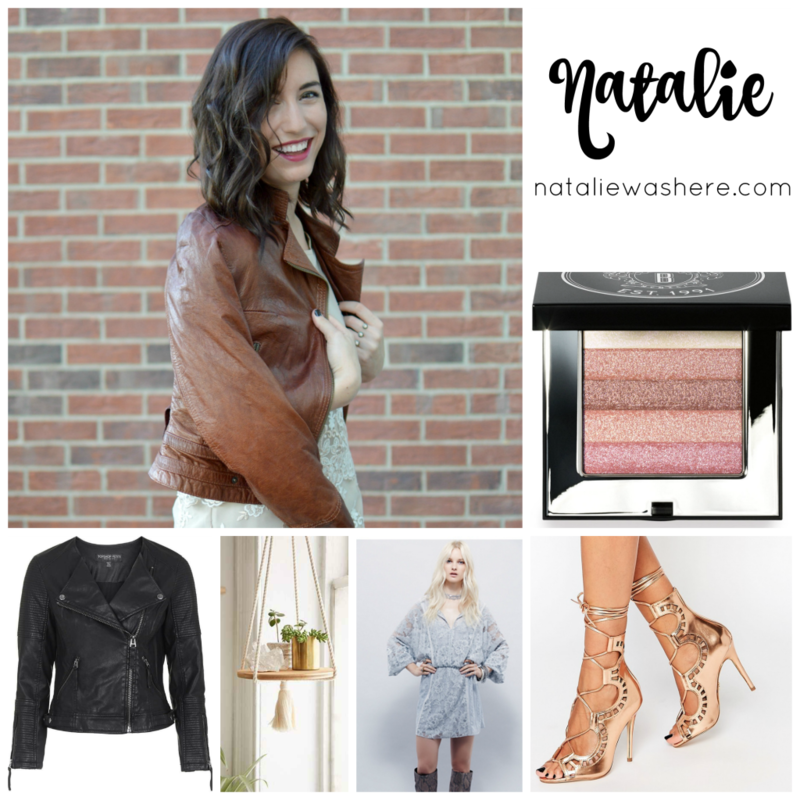 Black Faux Leather Jacket – A black faux leather jacket adds a bit of edge to any look, can be dressed up or down, and is the perfect addition to a girl’s closet. If you ask me, it’s a must! 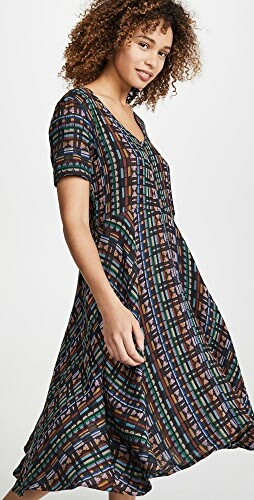 A Lacey Boho Dress – Free People knows a thing or two about “boho-chic.” I’m convinced they invented it. This lacey dress is so pretty, and could easily be worn all-year round. Bobbi Brown Shimmer Brick – Bobbi Brown is a genius who knows the secret to creating the perfect highlighter. Her shimmer bricks give the most gorgeous glow. I don’t typically splurge on makeup, but when I do, it’s Bobbi all the way! Floating shelf – I’ve been really into decorating my apartment lately. I’m all about a space that’s bright and inviting — and that involves white walls, wood floors and lots of plants. This floating shelf is the coolest, and I can easily see it hanging in the corner by a window. Goddess Ribbed Legging for Studio B classes via Carbon 38 – I am totally obsessed with Studio B Wellness, where I teach and take barre in GV. I am currently coveting the Goddess Ribbed Legging via Carbon 38 to spice up my barre wardrobe with just enough texture to make them feel special every time I put them on! The Claire Ring in Rose Gold from One Six Five Jewelry – Is there anything more perfect than a delicate ring in rose gold? I can’t get enough of The Claire Ring in Rose Gold from One Six Five Jewelry. 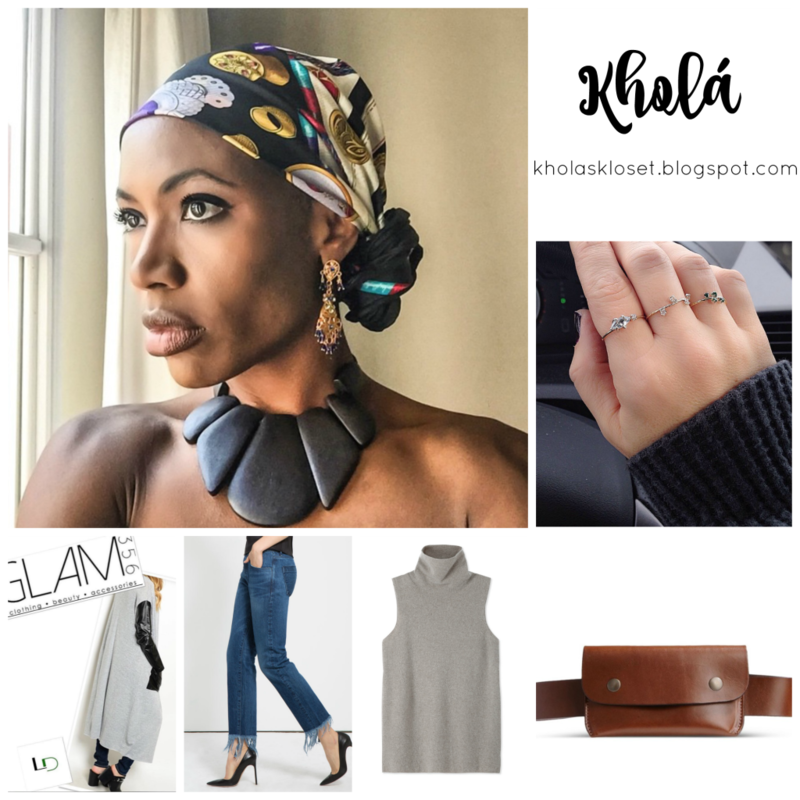 I love when a piece of jewelry can effortlessly go from casual to dressed-up, and this one is perfect paired with jeans and a t, or a holiday party LBD. Gift Certificate to Cherbourg Bakery – My Saturday isn’t complete without a cup of pour-over and a gluten free breakfast treat from Cherbourg. This place is magic & every Saturday that we can, my hubby and I get there when the doors open at 7 for a quiet (& delish!) weekend morning ritual. I can’t think of anything I would rather give or get than a​ Gift Certificate to Cherbourg bakery​! Their treats also make the perfect hostess gift for a holiday gathering. J. Crew Jumpsuit – The beauty of a jumper is that it has all the ease of a dress with all the comfort of pants. I have a few casual jumpers, but I am ready to take the relationship to the next level with ​the perfect holiday jumper, like this ​silky, gold-flecked crossover jumpsuit via J. Crew. 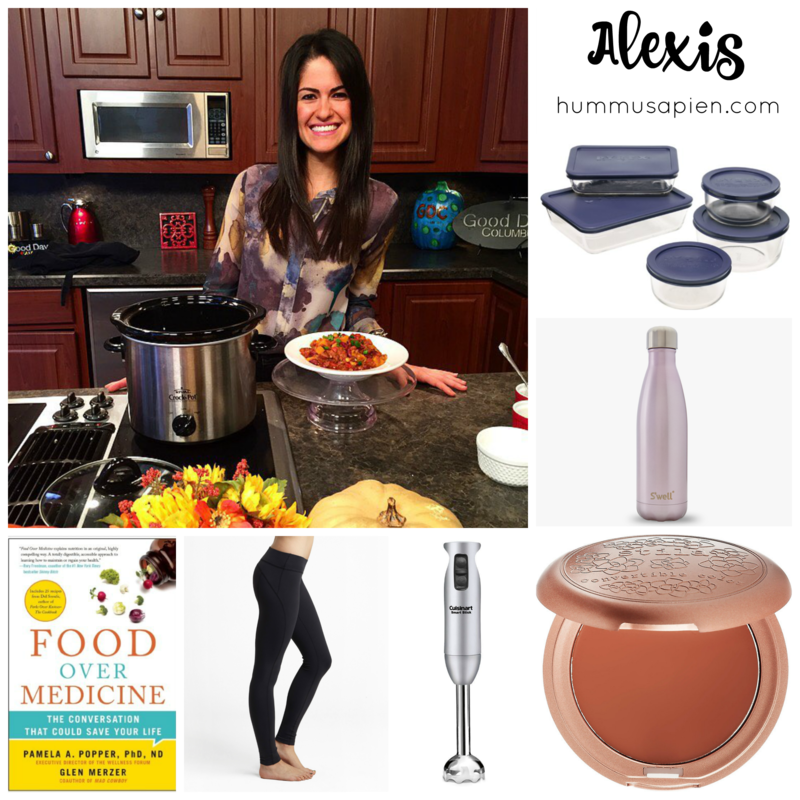 Hemsley & Hemsley’s The Art of Eating Well – Wouldn’t it be fun to give the gift of healthy, nourishing, beautiful, delicious food to everyone you loved? That is what I feel like I am doing when I gift Hemsley & Hemsley’s The Art of Eating Well. This cookbook, curated by the inspiring Hemsley sister’s is a work of art while still including accessible and mouthwatering recipes! I love seeing someone I care about unwrap this gift, which I keep out in my kitchen at all times! Handmade Weave by Joslyn Winkler – My BFF is an incredible artists and recently started hosting weaving workshops around Chicago and selling her gorgeous weavings on Etsy! Her handmade pieces are perfect to soften a collage wall or workspace. I love that each weaving is unique, and this Neutral/Peach is my absolute favorite! Nike Free 5.0 – I’ve been in the market for a new pair of workout shoes and these are the perfect combo of cool, clean, and chic! “Acai What You Did There” Pull Over – TBV Apparel – Because…how could I NOT ask for this?! Feed 10 Canvas Pouch – Feed Projects – I love the look of these canvas pouches, but love the cause they support even more. Each FEED Project purchase provides meals for school-aged children in Kenya! Food52 Genius Recipes – Food52 – I could stare for endless hours at Food52’s Instagram page (and sometimes do), so when I saw this cookbook, it immediately went on my Christmas list! I’m drooling already. Scuba Hoodie III – Lululemon – This is my favorite hoodie of ALL time (I’m embarrassed to admit I already have it in two colors!) 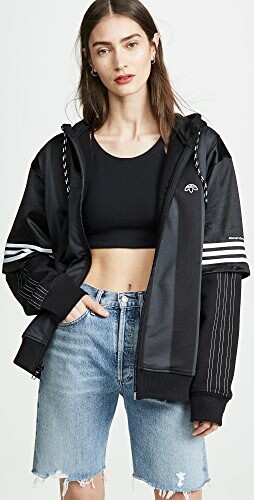 But it’s my go-to in the fall and winter months for when I’m out running around or having a lazy day at home. Sweater Coat by Lubna Designs – When you combine a leather sleeve and a long grey knit, it’s just asking to be added to my wishlist! Available at Glam356 Columbus (Call boutique for pricing). The Row ‘Leona’ Knit Top – Did I mention I have a thing for grey sweaters? Well, I do! This sleeveless cashmere blend from The Row, the ‘Leona’ is a must have for Fall, Winter layering AND Spring. Clothing for me must be versatile. This piece is the perfect example! CaleCameo Jewelry – Since we all need a bit of sparkle in our lives, why not on our fingers? One of my favorite local jewelry designers, CaleCamo hand makes the most delicately beautiful pieces with genuine stones and precious metals. And her prices fit almost any budget. Sparkle on!!! (Contact for orders via FB at CaleCamoJewelry). 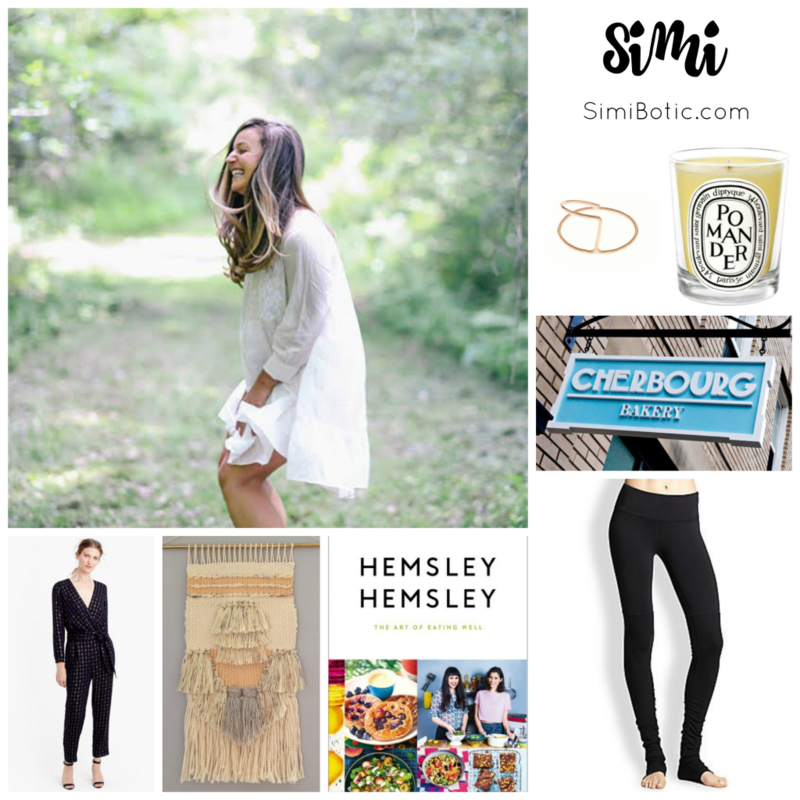 W3M Crop Fringe Lima Jeans – The jean I’ve had my eye on for at least a month. It’s that good! On trend but not over the top. Make a statement in your new favorite pair of denim. Called the W3M Crop Fringe Lima – sports a 4″ fringe bottom. So, so fun! Watershed Old Fashioned – I am absolutely obsessed with this new offering from Watershed Distillery. All the fancy feelings of drinking a delicious bourbon cocktail with out any of the effort required to actually MAKE one – just pour over ice and enjoy. And refill. And repeat. Codenames – I run the Beers and Boars Games Club of Columbus so I play a LOT of games but this one is my current favorite. Give your teammates one word that will clue them into where your agents are hiding, but be sure to avoid words that might lead to the other team’s agents! A super fun social word game. Crafted Drafts Gift Card – With over 700 different beers in the store at any time, ALL of which are available in single bottles, a gift card to bottle shop Crafted Drafts is a must for any craft beer lover. 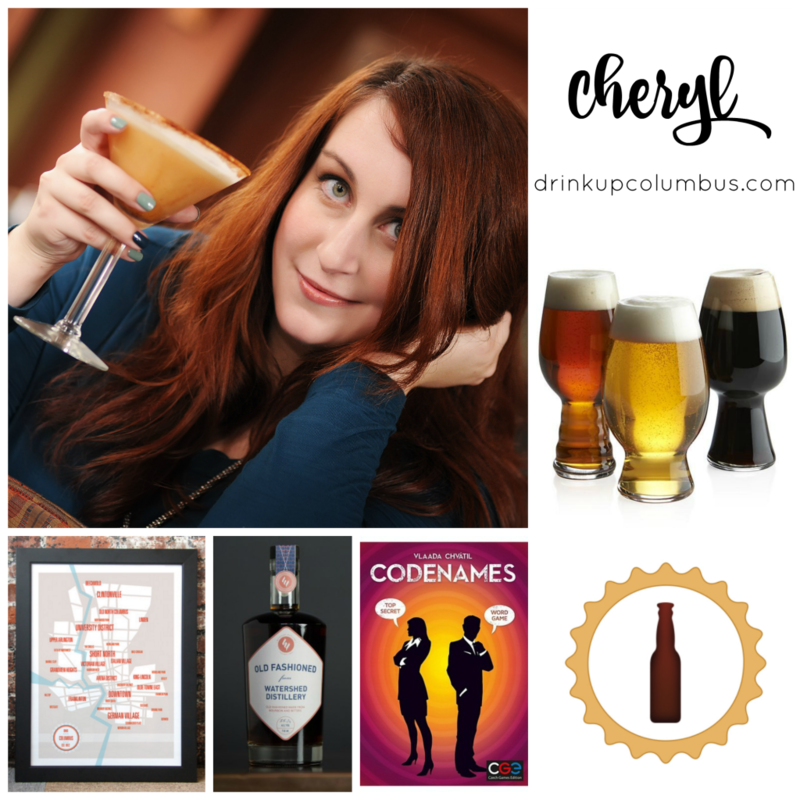 These Are Things Columbus Map – There are so many cool prints of Columbus and Ohio, especially at stores like Celebrate Local, but I’ve had my eye on this “These Are Things Columbus Neighborhoods map” for a few years now. Spiegelau Glasses – Having done several taste tests of beer in Spiegelau’s style-specific beer glasses versus other glassware, I am a believer. Spiegelau’s IPA, stout and wheat glasses make a big difference in enjoying beer, so do your beer a favor and pour it in the proper glass. A friend and an incredible artist, small business owner Rebecca Mortensen creates the perfect paintings for those who love the western-urban chic look. This is so me and I need to have her work in my home! Pricing varies by size and prints can be purchased at www.dalyartistrep.com. A Teepee for Teddy – how perfect! Pipolli has totally mastered the dog teepee and apparel game. I’m pretty sure my spoiled little guy has to have this. 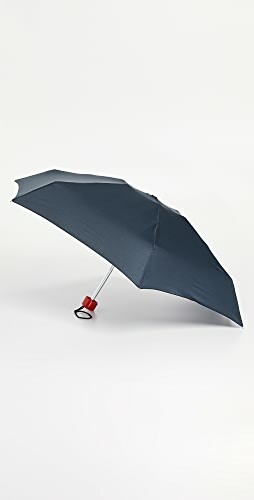 You can purchase at www.pipolli.com for $63. Canon Rebel – Okay, so I have to have a white Canon Rebel, it’s just too cute! With wifi included, it runs $569, so I’m pretty sure I’m going to have to save up for this one, because I can tell you now, no one is checking this off my wish list! Grill – This grill is everything. For someone like me who doesn’t have a huge patio, it’s the perfect size. 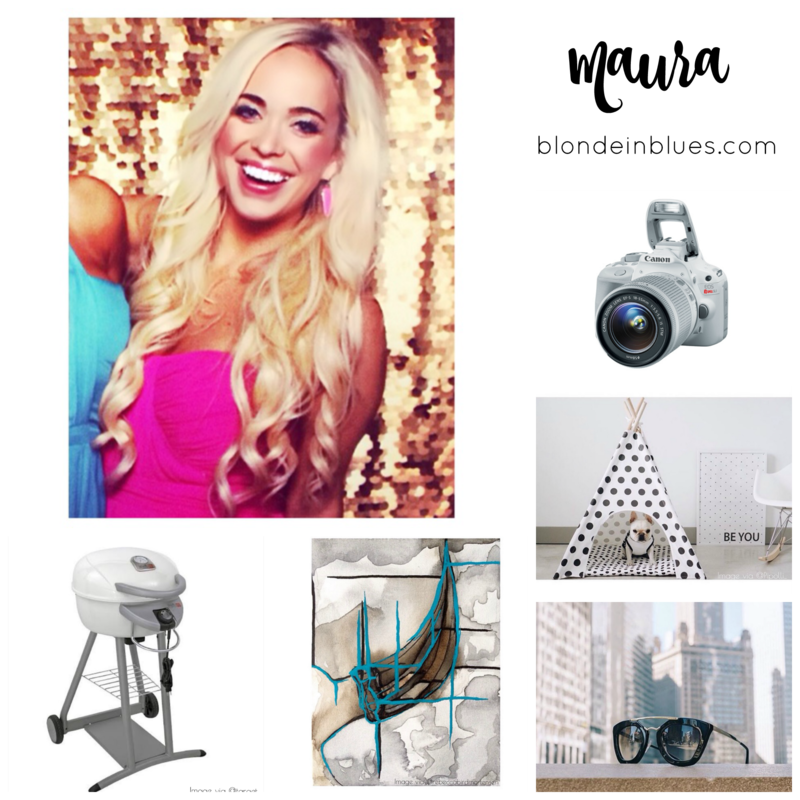 Warning: me wanting this grill does not mean I’ve learned to cook, I’m still clueless, but maybe this will help?! It can be purchased at Target for $169. Prada Sunnies / Membership to Ditto – These sunnies have been on my wish list for a looong time now, but the problem is: I break/lose/sit on my sunglasses so often I can’t reconcile purchasing them. So, my wish is not just for these sunglasses, but for a membership to Ditto so I can rent them and a bunch of others for just $24/month. Win! Food Over Medicine: The Conversation That Could Save Your Life – Dr. Pamela Popper, the science editor behind Forks Over Knives, is a Columbus native and she played a key role in inspiration behind my plant-based life-style. I can’t wait to sit down with a cup of coffee and dive into her latest! Immersion Blender – How do I not have one of these in my life?! I hate having to transfer soup to the blender. I think this would totally change my soup game. Pyrex Glass Tupperware – Because you literally can’t ever have enough Tupperware. Beyond Yoga Leggings – Beyond Yoga makes my favorite leggings EVER. 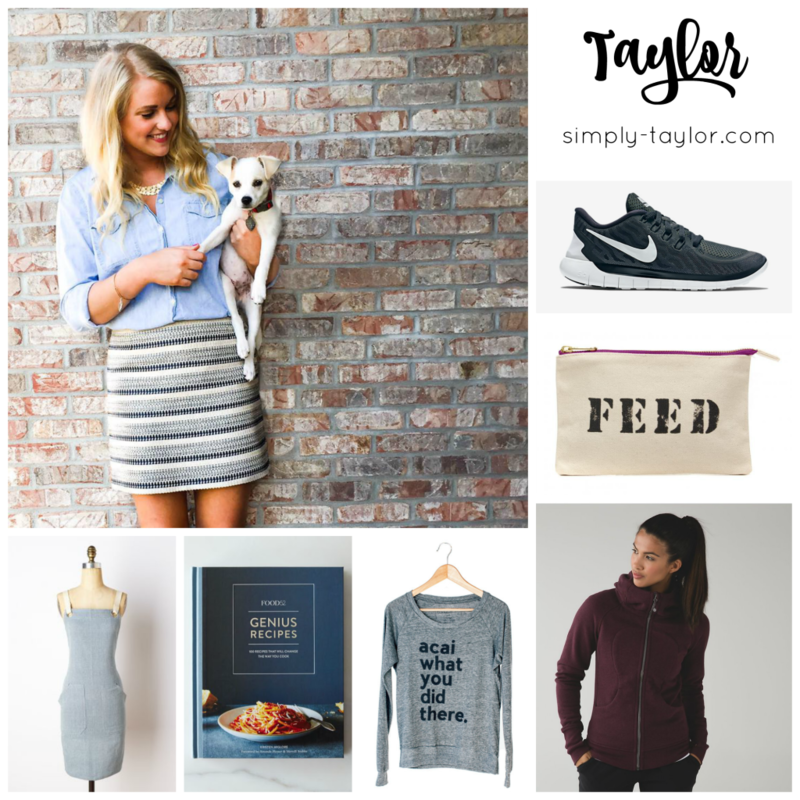 They’re insanely comfortable, flattering, and perfect for Barre3 or wearing day to day. S’Well Water Bottle – It’s reusable, it’s BPA-free and it’s pretty. Yay! Stila Convertible Color Blush – The best thing that ever happened to my cheekbones. Period. The Magic Strings by Frankie Presto – by Mitch Albom – For all you book worms looking for a good read, Mitch Albom released his new book called, The Magic Strings by Frankie Presto. His books are for a lifetime so if you want to give the gift that keeps on giving – buy his new release or any of his other works including: Tuesday’s with Morrie, The First Phone Call from Heaven, The Five People You Meet in Heaven or The Timekeeper. His books are timeless and great for all to enjoy. Fujifilm Instax Wide 300 Instant Camera (Urban Outfitters) – Shake it like a Polaroid picture – cues OutKast song. I truly enjoy the vintage feel of Polaroid photos so having the Fujifilm Instax Wide 300 Instant Camera was a must-have for my Christmas list. It not only brings back old memories, but will create new ones as well. Forget the selfie stick! Buy this for the inner child in you. The Manhattan Cocktail Case – If you’ve ever had a good cocktail, you may have a sparked curiosity on how to create one, am I right? My recent travels to the Southern Caribbean created the newfound love I have for beautifully-made and crafted cocktails so of course I need the Manhattan Cocktail Case to begin my journey. Poor Sparrow Turquoise Necklace – Looking for something new? Why not add this handmade necklace to your jewelry collection? I slightly favor the color turquoise, but even so – I’m still in love with the style, look and beauty it can bring to an outfit. Clothe Ohio Retro Red Ohio Flag Sweater – Don’t sacrifice looking cute just to stay warm – do both by purchasing a locally made Clothe Ohio Retro Red Ohio Flag Sweater. It’s a popular item, so get yours fast! UGG Slippers – Love the new UGG style slipper that keeps your ankles warm… So cute! Floor Length Light Grey Wool Overcoat – Currently in love with neutrals and light colors for winter… Gives your all black outfit a pop. High Waisted Skinny Jeans – High-waisted everything these days… Love to wear with bodysuits… My go-to outfit. Gold Flatware for Entertaining – What’s not to love ? It’s festive, stylish, and straight up cool. Your holiday table will never look the same. 100% Silk Pillowcase (for better hair & less wrinkles) – Let’s face it, no one wants wrinkles and Botox is expensive. So why not try out a silk pillow case? Also helps keep your hair smooth! Kilian Perfume (Love, Don’t Be Shy) – my personal favorite sent! It’s perfect for the holidays too.. Warm and romantic. 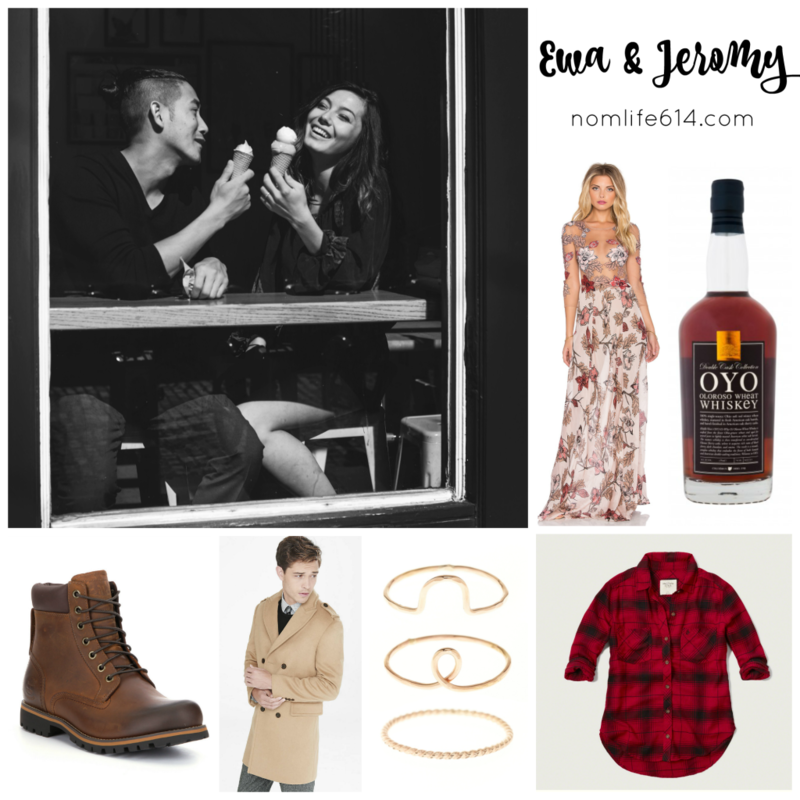 Check out Part 1 of the Wish Lists HERE! 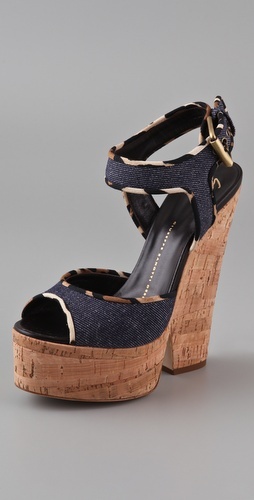 Shop Platform Pumps Shoes, Casual White Maxi Dresses, Off White Pumps, Black Booties Heels and more. Get this widget.